Marine reefs are suffer under the pressures of climate change and pollution. But in British Columbia, reefs have been given some good news. 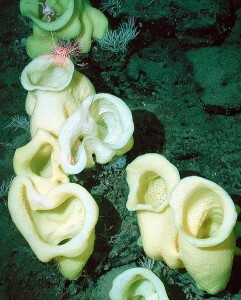 B.C.’s commercial spot prawn fishermen have agreed to voluntarily avoid nine prehistoric glass-sponge reefs. These reefs provide a complex and unique habitat for fish and other marine life. Thought to have gone extinct these fragile reefs are found in Hecate Strait and the Southern Strait of Georgia and provide vital habitat to a wide range of marine animals including endangered rockfish. But they are very sensitive to disturbances. As their name implies, these glass sponges are particularly susceptible to the impacts of crab and prawn traps or sport fishing gear trolled along the ocean bottom. Glass sponges are found in ‘shallow water’ (less than 500 m) in only four locations world wide: Antarctica, Southern New Zealand, some caves in the Mediterranean, and the fjords and continental shelf of the Pacific Coast of North America. Glass sponges are unusual animals because their skeleton is of nearly pure glass (hydrated silica dioxide). Sponges in this group settle on the skeletons of previous generations and over time, form giant sponge reefs, sometimes several stories high. Seventy-five percent of the world’s coral reefs are currently threatened by local and global pressures. The local threats from fishing, coastal development, and pollution combine with the global threats of warming waters and ocean acidification to threaten these species and the critical wildlife habitat they create. It has been projected that the percent of threatened reefs will increase to more than 90% by 2030 and to nearly all reefs by 2050. The voluntary actions taken by the prawn fishing industry is a positive step to reversing these trends.